TLC® "Essentials™", Art. E514 (6 ounce/312 yard skeins): 11 Ounces No. 2313 Aran. Knitting Needles: 6mm [US 10] and 6.5mm [US 10.5] Cable needle; 2 stitch holders; yarn needle. 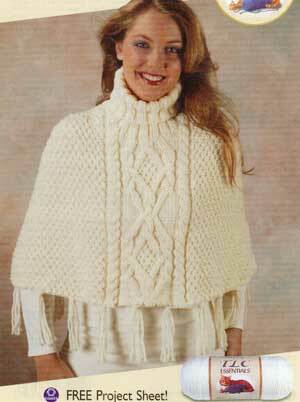 GAUGE: 14 sts = 4"; 19 rows = 4" in St st on larger needles. M1 = make one st by picking up horizontal strand before next st and knitting into back of loop. C4B = sl 2 sts on cn, leave at back, K2, K2 from cn. C4F = sl 2 sts on cn, leave at front, K2, K2 from cn. C3BP = sl next st on cn, leave at back, K2, P1 from cn. C3FP = sl2 sts on cn, leave at front, P1, K2 from cn. C4BP = sl 2 sts on cn, leave at back, K2, P2 from cn. C4FP = s12 sts on cn, leave at front, P2, K2 from cn. C6B = sl 3 sts on cn, leave at back, K3, K3 from cn. C6F = sl 3 sts on cn, leave at front, K3, K3 from cn. Row 1 (RS): C4F, P7, C3FP, C4F, C3BP, P7, C4B. Rows 2, 4, 6, 8, 10, 12: K the K sts and P the P sts as they face you. Row 3: K4, P8, [C4B] twice, P8, K4. Row 5: C4F, P7, C3BP, C4F, C3FP, P7, C4B. Row 7: K4, P6, C3BP, P1, K4, P1, C3FP, P6, K4. Row 9: C4F, P5, C3BP, P2, K4, P2, C3FP, P5, C4B. Row 11: K4, P4, C3BP, P3, C4F, P3, C3FP, P4, K4. Row 13: C4F, P2, C4F, P3, C3BP, C3FP, P3, C4B, P2, C4B. Row 14: P4, K2, P4, K3, P3, K1, P2, K3, P4, K2, P4. Row 15: [K4, P2] twice, C3BP, K1, P1, C3FP, [P2, K4] twice. Row 16: [P4, K2] twice, P3, K1, P1, K1, P2, [K2, P4] twice. Row 17: C4F, P2, K4, P1, C3BP, [K1, P1] twice, C3FP, P1, K4, P2, C4B. Row 18: P4, K2, P4, K1, P3, [K1, P1] twice, K1, P2, K1, P4, K2, P4. Row 19: K4, P2, C4F, C3BP, [K1, P1] 3 times, C3FP, C4B, P2, K4. Rows 20, 22, 24, 26, 28, 30, 32, 34: Rep Row 2. Row 21: C4F, P2, K2, C4B, [K1, P1] 4 times, C4F, K2, P2, C4B. Row 23: K4, P2, C4F, C3FP, [K1, P1] 3 times, C3BP, C4B, P2, K4. Row 25: C4F, P2, K4, P1, C3FP, [K1, P1] twice, C3BP, P1, K4, P2, C4B. Row 27: [K4, P2] twice, C3FP, K1, P1, C3BP, [P2, K4] twice. Row 29: C4F, P2, C4FP, P3, C3FP, C3BP, P3, C4BP, P2, C4B. Row 31: K4, P4, C3FP, P3, C4F, P3, C3BP, P4, K4. Row 33: C4F, P5, C3FP, P2, K4, P2, C3BP, P5, C4B. Row 35: K4, P6, C3FP, P1, K4, P1, C3BP, P6, K4. Row 36: Rep Row 2. Rows 1- 36 form panel. FRONT: With larger needles, cast on 97 sts. Foundation Row (WS): K36, [M1, K4] 6 times, M1, K37 - 104 sts. Row 1 (RS): [P1, K1] 17 times, P2, work panel Row 1, P2, [K1, P1] 17 times. Row 2: [K1, P1] 17 times, K2, work panel Row 2, K2, [P1, K1] 17 times. Row 3: [K1, P1] 17 times, P2, work panel Row 3, P2, [P1, K1] 17 times. Row 4: [P1, K1] 17 times, K2, work panel Row 4, K2, [K1, P1] 17 times. Rows 1 to 4 form Moss st pat at sides of panel; panel is now in position. Keeping continuity of pats, work 2 more rows. Shape Sides: Dec 1 st each end of next row, then every 4th row until 76 sts rem, then every RS row until 66 sts rem. Work 1 row even, end panel Row 34. Shape Shoulders and Neck: Bind off 3 sts, work across 21 sts (including st on needle after bind-off); TURN leaving rem sts on a holder. Dec 1 st at neck edge on next 6 rows, then every RS row twice, AT THE SAME TIME, bind off 3 sts at shoulder edge on RS rows twice more, then dec 1 st at same edge every row 5 times - 2 sts. Next row: P2tog. Fasten off. With RS facing, leave center 18 sts on a holder; join yarn to rem sts and work to correspond to first side reversing all shapings. BACK: With larger needles, cast on 97 sts. Foundation Row (WS): K. Rows 1 and 4: P1, * K1, P1; rep from * across. Rows 2 and 3: K1, * P1, K1; rep from * across. Rows 1 to 4 form Moss st pat. Work 2 more rows. Shape Sides: Keeping cont of pat, dec 1 st each end of next row, then every 4th row until 69 sts rem, then every RS row until 59 sts rem. Work 1 row even. Shape Shoulders: Bind off 3 sts beg next 8 rows, then dec 1 st each end of next 4 rows. Put rem 27 sts on a holder. FINISHING-Collar: Sew right side seam. With RS facing and smaller needles, pick up and K12 sts down left front neck edge, K18 from front holder dec 3 sts evenly, pick up and K12 sts up right front neck edge, K27 from back holder - 66 sts. Row 1 (WS): P2, * K2, P2; rep from * across. Row 2: K2, * P2, K2; rep from * across. Rep Rows 1 and 2 for 8" end Row 1. Bind off in ribbing. Sew side and collar seam, reversing seam for turnback. Fringe: Knot four 12" lengths of yarn approximately 2 ½" apart around lower edge. Trim. ABBREVIATIONS: beg = beginning; cn = cable needle; dec = decrease; inc = increase; K = knit; mm = millimeters; P = purl; pat = pattern; rem = remaining; rep = repeat; sl = slip; St st = Stockinette st (K 1 row, P 1 row); st(s) = stitch(es); tog = together; * = repeat whatever follows the * as indicated; [ ] = work directions in brackets the number of times specified.